A weekly challenge that provokes the mind into a poetic side. 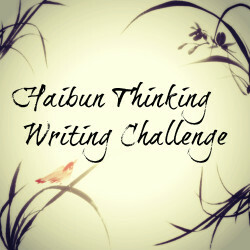 The idea is to create a “Haibun” from the given prompt. The prompts come in a choice over a four-week rotation, with the last week being a freestyle – anything you want, no prompt. The prompts are anything, from images to quotes from films, quotes by actors, directors, artists, art critics etc. Each prompt can be taken however your mind sees the prompt and wherever it takes you. The only stipulation is that you include the haiku as described above, usually (but not always) at the end of the post. This challenge was created by Alastair from A Mixed Bag, Anja from “Oh Pithy Me“, “AnElephantCant” and Michael from “Morpeth Road“. They are always after new photos and artwork to use as prompts with full credit being given to the photographer and artist. Relatively new on the scene, be sure to give this weekly challenge a try! For more information go here!